AMD's latest APU is heading into the wild today, and among its touted features is the ability to perform high-end functions with low power sap. Testing is needed to determine if Kaveri really pushes higher performance per watt while saving battery life, particularly in smaller form factors (AMD is targeting notebooks with the APU). But until then - and trust us, testing is on the way - AMD gave TechRadar a few cases in point where Kaveri trumps the APU and processing options we've seen to date. We even get a little insight on possible usage in Steam Machines, too. We caught up with AMD's Adam Kozak at CES 2014, and the senior product marketing manager noted a key difference between Kaveri and the company's APU before it, called "Richland." "[Kaveri is] much more power efficient than anything we've had before," Kozak said. "If you actually get a chip and you watch it run during benchmarks, you see in some cases that it actually down clocks the CPU during a benchmark. Richland never did that before. "Richland would go down to its default clock and sit there while the benchmark was running. Kaveri will even go lower if it can see that the CPU or GPU isn't needed during that benchmark. "So the guys have worked really hard at optimizing the power states and detecting where it's needed and it'll just crank it right down. It's much more efficient then Richland ever was." Kozak also called to mind a demo AMD performed a few weeks ago to not only show Kaveri's compute prowess but also how it compares efficiency-wise to rival Intel. AMD is gunning after Haswell - specifically its Core i5 - with the Kaveri stack, even undercutting Intel's low-power chip on the price tag. As Kozak recalled, the AMD team was showing off Kaveri's ability to frame rate convert Blu-rays. "Some TVs run [Blu-rays] at 24 frames, but your monitors definitely run at 60 frames," he explained. "If you ever watch a Blu-ray on your monitor, what it has to do is copy all those extra frames to duplicate them from 24 so it equals 60. A lot of frames are repeated. When you're watching something go across, it actually stutters because it's the same frame being shown several times. "What we do now with Kaveri is we actually interpolate. We use compute to say, 'Here's the next frame, let's figure out that maybe the difference is ...' and we create a new frame. And it's much smoother when it goes across. We can use Kaveri to all this compute computation. "While we were doing this, we had it plugged into a wall meter, and the whole system itself was generating about 50 Watts," he said of the demo. "That's the whole system - hard drive, memory, everything. And the system beside it, an Intel system, generated well over 100 Watts with a graphics card in it. "So Kaveri can not only do these really high-end features, but it can do them at very low power, and that's what you want in an HTPC or a home theater type environment." Though Kozak couldn't comment on unannounced partner products, the question arose whether the Kaveri and its low wattage would ever find its way into Steam Machines. "I can tell you that Kaveri is actually a very unique part because of this feature [called] configurable TDP," Kozak said. "There's a setting in the BIOS [where] you can change your processor to run at 65 Watts or 45 Watts just with the click of a button. "That's something where if you want a very small form factor, like a Steam Box, you could have the SI automatically do that at the start. And it would allow you to put in a better graphics card if you wanted and use that TDP elsewhere. Or you could just reduce the form factor and use it." TDP stands for thermal design power, or the amount of power a chip will dissipate in Watts. A low TDP means easier cooling and fanless and small fan designs with more room for graphics, ideal for machines like Ultrabooks and, yes, Steam Machines. Both AMD and Intel have made their way into announced Machines, but perhaps a new chapter in their ongoing silicon war will heat up if Kaveri shacks up with a Box? Kaveri seems primed for the fight. 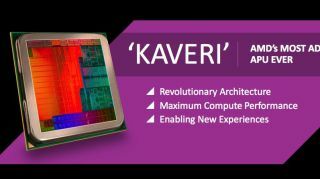 Kaveri isn't AMD's only APU planned for 2014.